By now you probably know that style-wise I’m a bit old fashioned. The sleek modern look is not one you’ll find in my home. Here and there perhaps as a radio, a phone or a lantern. For the most part though, my style is eclectic with a touch of nostalgia. 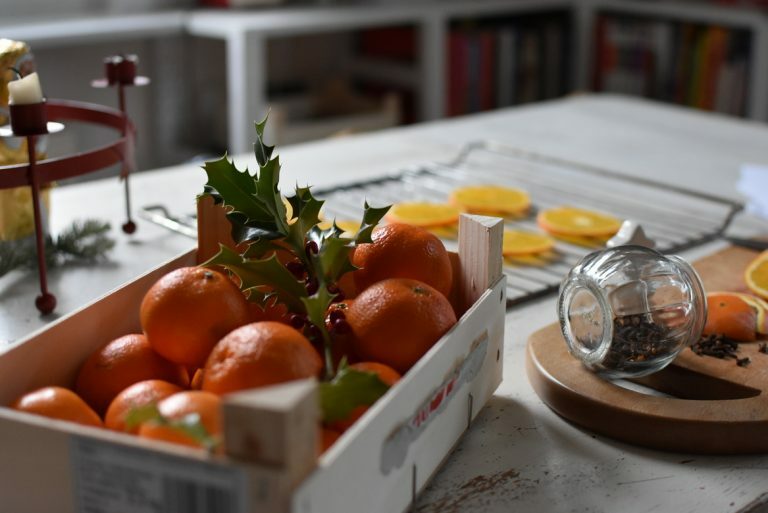 When it comes to Christmas, I like nothing more than lots of greenery, reds, gold or silver, plenty of white and natural materials – wood, moss, straw, cinnamon sticks, cloves, oranges. This year in particular, in the absence of a tree, I’ve been dotting the house with garlands, wreaths, candles and bowls of various arrangements. 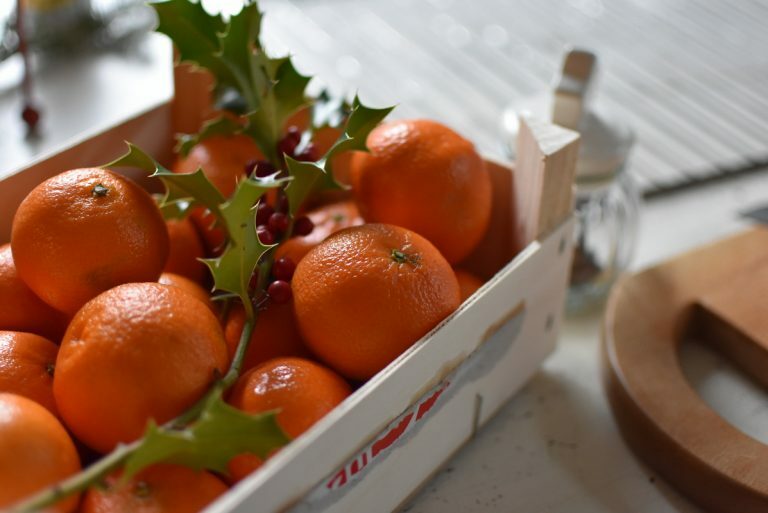 Oranges and mandarins make for good value when it comes to bright, nostalgic decorations. I love bowls of them around the house, combined with walnuts, a sprig of holly, dotted with cloves or simply surrounding a white candle. Orange slices make a beautiful decoration too, but it is possible that I enjoy making them as much as I enjoy decorating with them. Have a you ever made them? The smell they send through the house is the essence of Christmas – well, perhaps a close second to mulled wine. 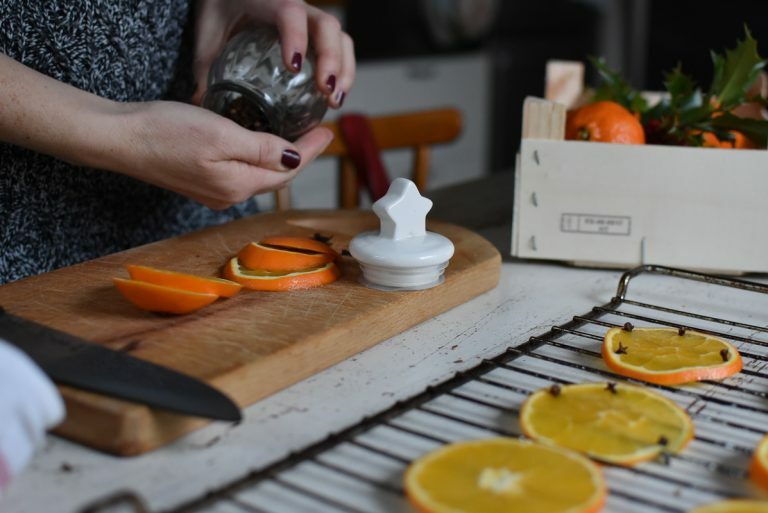 Definitely a scent you’ll want to bring back year after year, once you’ve made dried orange slices for the first time. 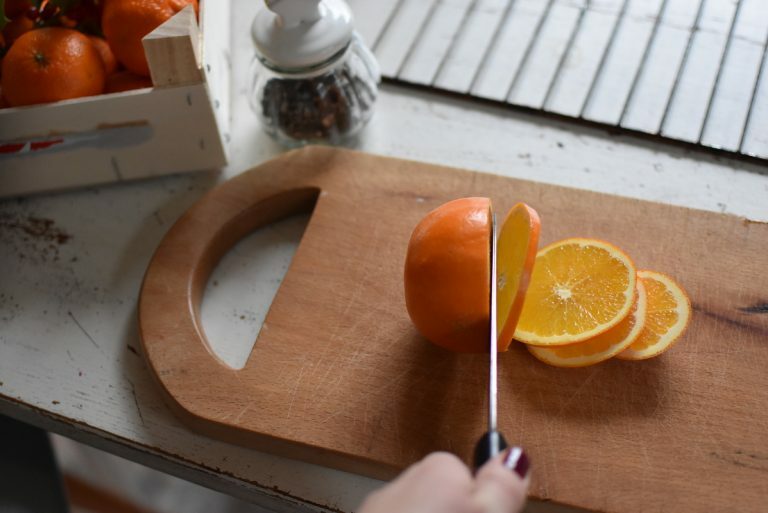 Each orange will give you about 8 good-sized slices, not counting the end pieces.You need to slice the oranges finely but thick enough that you can stud the edges of each slice with cloves. 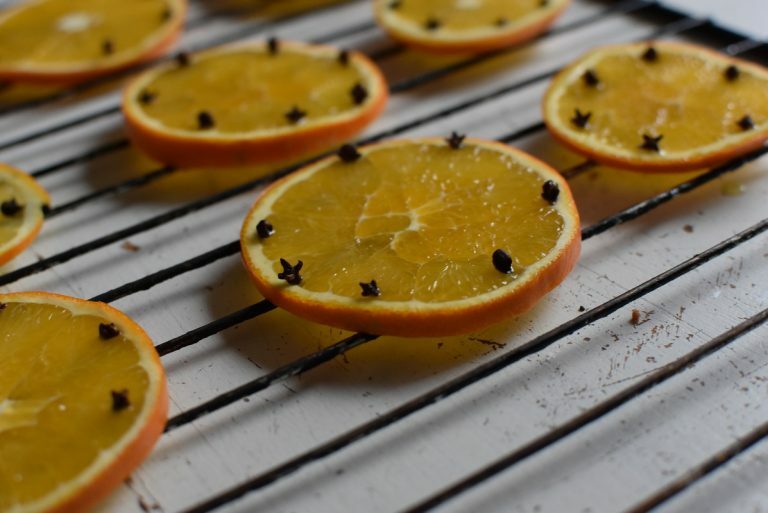 Lay the sliced oranges out on the wire tray then begin adding the cloves. Per orange slice you’ll need to use 6-8 cloves. Depending on the thickness of the rind, you can jab the cloves into the rind or into the orange flesh at the point where it meets the orange rind. 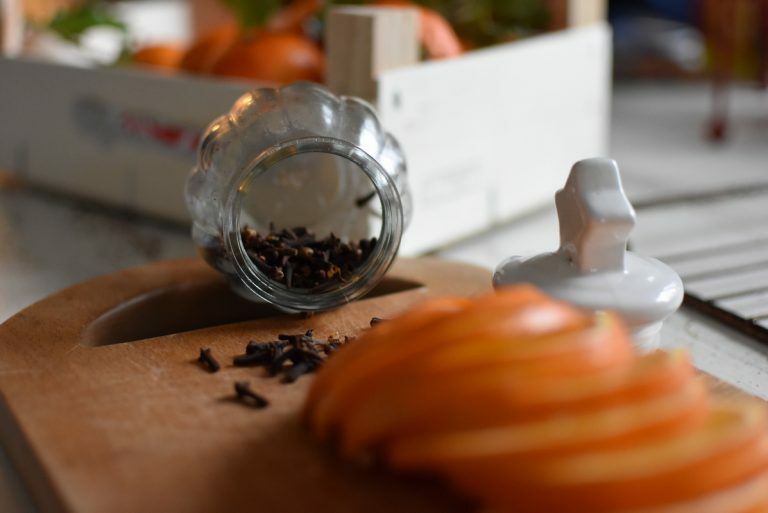 Dot the cloves at regular intervals around each orange slice. Don’t worry if the cloves seem a little loose. The drying process will secure them in place as the orange shrinks a little. 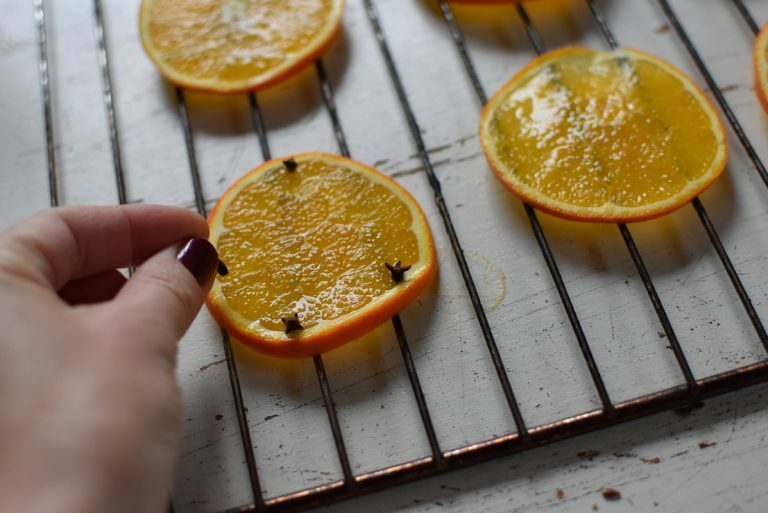 To dry your orange slices, place the wire try in the oven, close the door and leave the slices for between 45 minutes and 1 hour. After that, if the oranges are not fully dry leave them in the oven, checking on them every 5 to ten minutes so that they don’t get too much colour. You want them to still be orange, not brown. 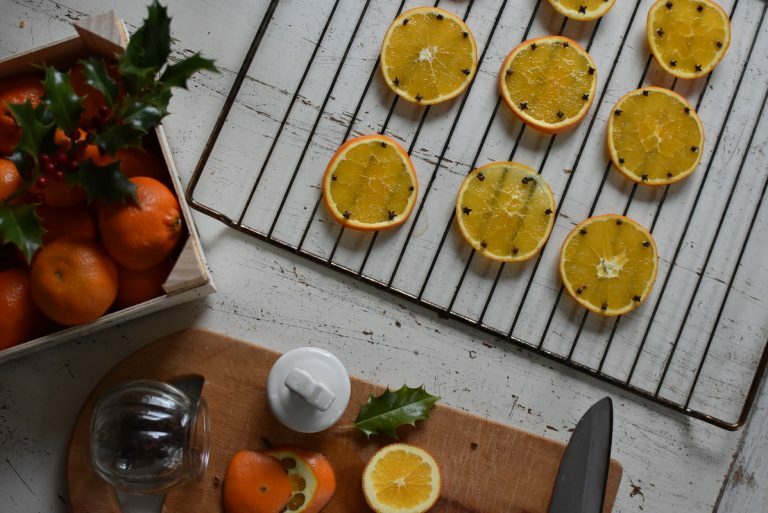 So what do you do with your dried orange slices once they are finsihed and your home smells of Christmas? Try threading them on bakers’ twine as a garland or as Christmas tree ornaments. Or use a hot glue gun to attach the dried orange slices to a Christmas wreath. Use them as a decoration on gifts wrapped in brown paper and tied with string. Or simple pile them into a wide bowl with nuts in their shells as an attractive centrepiece for your coffee table or sideboard. That’s it exactly Nicola. They are so easy and cheap too. Thanks. They smell divine while baking.